In the latest attack, the rebels hacked to death villagers and made others carry looted goods. One abductee, 17-year-old Jean-Claude Singbatile, was captured with a group of friends and spent days carrying bags of salt. "As we marched, the LRA killed people - two at one village, three at the next and then four at the next," he told the BBC. "They wanted to kill me, but the leader said I should be kept alive, as they needed strong soldiers." Eventually, one of the rebels warned him that he would also be killed and should take his chance and run for it. "He warned me because he is an Azande, like me," said Jean-Claude, referring to his ethnic group. Mehrere Tage wüteten die Rebellen bei ihrem 100 Kilometer-Marsch zwischen dem 14. und 17. Dezember in der Region. Einen Monat später verkündete die Gruppe das Ende ihres Kampfes. Seitdem tötete sie in Uganda, der Zentralafrikanischen Republik und der DR Kongo mehr als 120 Menschen. Die Armee des Kongo konzentriert sich gerade auf die Zerschlagung der "Forces démocratiques de libération du Rwanda" (FDLR) und verkündete in ihrer Offensive mehr als 600 Rebellen getötet zu haben. Gleichzeitig konkretisierten Offizielle der kongolesischen Regierung die Abzugsforderungen. Wie allerdings die reguläre Armee ohne logistische und militärische Unterstützung die Landstriche im Osten und Nordosten unter Kontrolle bringen und halten soll, ist aber völlig unklar. The United Nations Peacekeeping Mission in Congo (MONUC) has some 1,000 peacekeeping troops in the LRA-affected areas of northeastern Congo - far too few to protect the population adequately, given the area's size. Yet instead of sending more troops, the peacekeeping force, under pressure from the Congolese government to withdraw from the country by July 2011, is considering removing some troops from the northeast by June in the first phase of its drawdown. Währenddessen hat die LRA die Vorwürfe zurückgewiesen. Ein Sprecher der Gruppe sagte in Nairobi, man habe "keine Probleme mit den Menschen im Kongo" und würde weiter für einen Waffenstillstand eintreten. The attack was well-planned and organized. Under the leadership of at least two LRA commanders, Lt. Col. Binansio Okumu (also known as Binany)27 and a commander known as “Obol” (see below), LRA combatants attacked a succession of villages and towns, each time posing as Ugandan or Congolese army soldiers first, then killing and looting, before taking with them large numbers of abductees tied together. 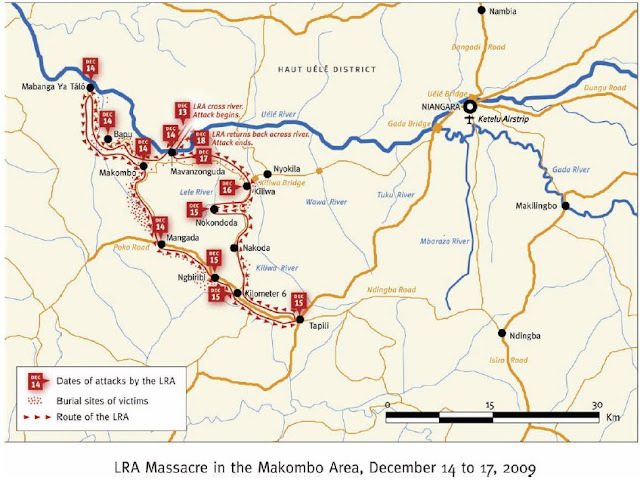 The tactics used by the LRA during the Makombo operation indicate that their purpose was to kill, abduct, and pillage. The operation may in part have been to re-supply the group with new recruits and essential supplies, such as salt, sugar, batteries, and clothes. Hinzu kommt, dass die LRA mittlerweile in mehrere Gruppen von 80 bis 250 Mann zerfallen ist und so ein Oberbefehl kaum mehr existiert. Oft richten sich die Gewalttaten nach den Bedürfnissen und dem Versorgungsstatus der Rebellen.